This American Heart Association course is designed to teach the skills of CPR for victims of all ages, use of an automated external defibrillator (AED), and relief of choking. Ideal for learners who prefer group interaction and feedback from an instructor while practicing skills. This course is designed for healthcare providers (EMS personnel, physician assistants, physicians, dentists, nurses, respiratory therapists) and others who must have a credential (card) documenting successful completion of a CPR course; however the course is open to everyone. See the AHA course information card here. The American Heart Association Advanced Cardiac Life Support (ACLS) Refresher Course is designed for healthcare providers who either direct or participate in the resuscitation of patients, whether in or out of hospital. Throughout the ACLS class, participants will enhance their skills in the treatment of the adult victim of a cardiac arrest or other cardiopulmonary emergencies. ACLS emphasizes the importance of basic life support to patient survival, the integration of effective basic life support with advanced cardiovascular life support interventions, and the importance of effective team interactions and communications during emergency events. Active participation in a series of simulated cardiopulmonary cases and megacodes reinforces course material. Each participant must review pharmacology and EKGs prior to the course. The interpretation of EKGs is not covered in this course. To enroll, participants must have a current AHA BLS card. This skills check is the in-person demonstration of the skills covered in the associated online program. It is intended only for students who have already completed the online portion of the course. If you need to enroll in the online course, you can do so here. 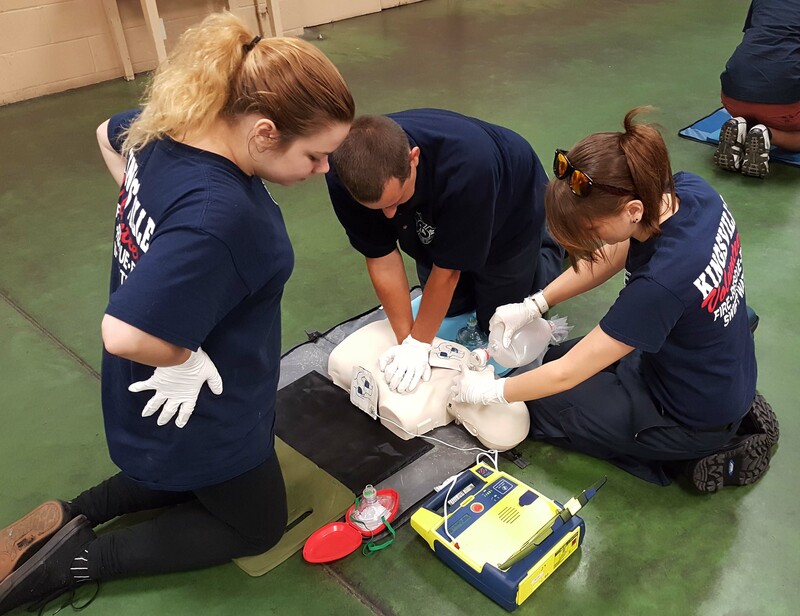 BCFMT's American Heart Association (AHA) Combination Basic Life Support (BLS) Advanced Cardiac Life Support (ACLS) classes will be conducted at the Reisterstown Volunteer Fire Company (RVFC). RVFC is located at 108 Main Street in Reisterstown, MD 21136. The AHA ACLS Refresher Courses offered by BCFMT, Inc. are designed for healthcare providers who either direct or participate in the resuscitation of patients, whether in or out of hospital. Throughout the BLS/ACLS Program, participants will enhance their skills to manage the adult cardiac arrest victim or patients experiencing other cardiovascular emergencies. The AHA ACLS (2015 Guidelines) emphasize the importance of consistent basic life support, the integration of effective advanced cardiovascular life support interventions, and the need for effective team interactions and communications during emergency events. Active participation in a series of simulated cases and megacodes allows participants to reinforce the course content. Each participant must review pharmacology and EKGs prior to the course. The interpretation of EKGs is not covered in this course. To enroll participants must have a current AHA ACLS and AHA BLS Card. These cards must be brought to class at the time of training. The cost of our AHA BLS/ACLS Renewal Class is $235. There is a fee of $40 if a one-on-one remedial session is required. Payment may be made via PayPal or credit card in the course enrollment section of our website (bcfmt.com). The registration deadline for each class is one week prior to the course date. An ACLS book is not included. If you need a class and cannot attend one of these sessions, email BABirago@aol.com to find additional options that are available. Please email BABirago@aol.com or call (410)-591-6058, should you have any questions or concerns.